Salta Basket clinched Super 4 de la Liga Argentina Concepcion del Uruguay title beating Barrio Parque 93-83. They won the first period 27-16 and added a narrow 18-5 run in the second frame. Barrio Parque posted a 25-19 run in the third period to reduce the gap, but could not win the game. Salta Basket needed a 29-27 rally at the end to clinch the title. 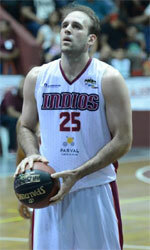 Lisandro Rasio (198-PF-90, agency: Pro Sports) was named MVP of the game as he collected 26 points, 10 rebounds and 6 assists.